1. Everyone involved gets to create a rule everyone in the group must follow. 2. There’s a set amount of time. 3. Everyone reads his or her draft. For practical purposes, I only allowed nine rules. I had to veto a couple that I knew would be impossible (no figurative language one kid said) or excruciating (make every sentence begin and end on the same word) or too easy (use all simple sentences). At first they were fairly simple rules but as time went on, they grew more and more eager to torture themselves and their classmates. Making the rules themselves is exciting. I gave them a subject well known to students everywhere: write about something that happened over Spring Break. Tell us a story, I said. I gave them thirty minutes. I said don’t worry about making anything good. It’s called a Garbage Piece for a reason: there’s way you should be able to produce anything good. Now try to, I said, smiling. You start dating after eight years of nothing but living alone. You will lose some things, you think. Days and days turn into nothing but writing, writing for days and days. The dog is the only one who looks at you some days. At night when you walk the dark train tracks so he can find relief, he sometimes disappears after a rabbit. You hear their hearts race in the dark ahead, a muttered half-curse from the dog as he comes back with nothing. He is a strange horse, a black panther, an ancient priest as he walks beside you, walking through a variety of floodlights, each one throwing off a different you. You loosen up. You tell yourself that. You begin to say hi to strangers who know you only through text. (You begin to realize how all those years of reading and writing pay off now, in that you can tell lies from half-truths, texts from terrified aging men who are afraid they’re too fat, too bald, too old.) You are praised for your honesty and articulation by a number of men who later admit to lying about facts, who are in a variety of relationships–open, partnered, looking, single, married, divorced. You begin to talk, by which is meant text–to a couple of them who interest you. One is bigger than you. One is smaller. One seems to have a better occupation, one seems quieter. It turns out you’re not as broken down as you thought. It turns out you remember the right things to say to attract attention. Some of them send you naked pictures as a way of saying hello. Every so often you invite one home. Hey, they like to begin, and you write back to them, if you want to, and say Hey. The dog starts avoiding the bed. Or he slides off the bed when the sound of your breathing changes. It turns out he is tired of watching over you every night to make sure you won’t run away. He goes down and looks out the windows at the dark street. “It’ll be all right now,” you hear him whisper in the hallway who might be your dead mother. “Good,” says a voice in return, more Chanel Number Five than words. 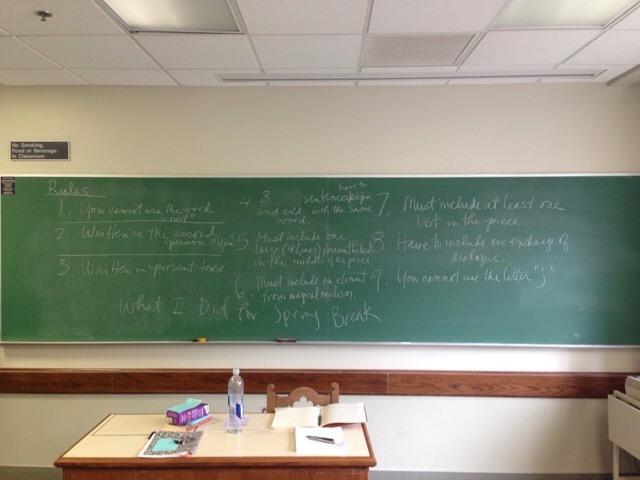 Here is a picture of the board, so if you feel like writing Garbage, you can give it a try. One warning: the time rule is important. Don’t do it over the course of the day. Set a timer and then go. Good luck! Dear Reader, I told you I cracked my iPad on Thursday morning didn’t I? Well I did. It was sad. But it’s under warranty, so it’ll get replaced at home. The takeaway: I didn’t need it. It’s an over-pack. I can do almost everything from my iphone, which in fact I spent some time last time talking about at the Pitt reception last night. Part of that conversation revolved around my sense that the iPhone as a camera and Facebook as a platform have changed both the way I see things and the way people see me. I even could trace a new gravity in my writing to about the time I regularly began taking photos of my walks with my dogs, my coffeehouse days, my friends, the little elements of my life. I have experimented with camera angles, framing tricks, sketches and drawing, videos, and sound recordings on my phones. I have learned to use the small composition spaces of status boxes, 140 characters, titles under photos, and the thumb-sized pages of the Notes app, where I’m writing this now. I originally bought my iPhone because I’d received a kill fee for a book project I was asked to work on. I am so glad I made that death of a project into an investment in new technology. Dear Reader, I saw two of my favorite Pitt poetry alumni last night, Brandon Som and Miriam Bird Greenberg. Both terrific poets with new books out. I’d seen Brandon earlier and had a Pike Market lunch with him and Dave Griffith, another Pitt Alum, who is doing wonderful things at the Interlochen Center for the Arts, including classes in digital essays. At the reception Brandon and Miriam, whose friendship started at Pitt, and whose lives have taken them to different places, got to see each other again. I am not to crusty an academic to say I love to see the hugging of suddenly reunited friends. We talked about life and writing and what’s next. That is one of the best parts of AWP, Dear Reader. Despite the bad press it sometimes gets (and deserves usually) for being full of frustration and isolation and loneliness, there are old friends who appear at AWP and you get to hold onto them for a minute, an hour, a day, in a temporary stay against the forces that inevitably will push you back to your separate landscapes again. You drink them up. You forgot how great they are as people. How much you love them. It’s suddenly all there. Boom, as the kids say. The flow of literate strangers around you bends around your sudden island of joy. For tax purposes, I should also say that all this reuniting has very practical results. We’re all off in our little places crafting and experimenting with ways to get other people to write, to develop skills, to train students of all kinds–ESL students, high school students, international students, veterans–how to open up the language and so widen and deepen themselves. As we catch up, it turns out we’ve discovered different ways to turn lead into gold in our separate worlds. There are a million ways maybe. We compare notes, techniques, assignments, theories, media. Oh, I found myself saying to old friends, that’s a great idea. I have a couple of new ideas to bring back home to Pittsburgh. At the end of the night, another old friend was feeling the other side of AWP. He’d gone to an event where he’d hoped to be more connected to people than he actually was. In him grew that terrible feeling of frustration, loneliness, turning toward anger, which most of turn inward, as if it were our fault, our lack of something that everyone else seems to have. The second day of AWP is often the most trying emotionally. We hung out in the lobby for a while just watching the varieties of other people as they passed by. We did that until we both felt sleepy. It was nearly 11. Then we went off to our separate beds. Dear Reader, for those of you who are following my insomnia, I went to bed happy at 11 and slept straight through until 4:30. A big improvement.